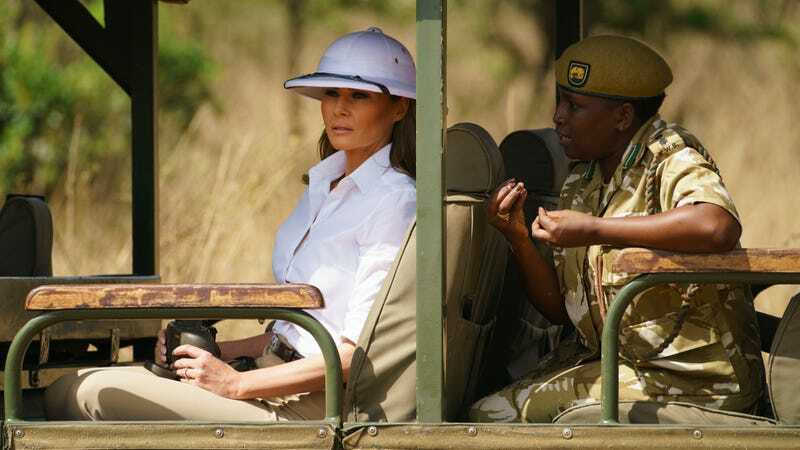 In keeping with her history of just really great and diplomatic fashion decisions, Melania is running around Africa wearing an actual goddamn pith helmet—a big, fat metonym for colonialism—square on top of her head. Pith helmets were worn by European explorers and imperial administrators in Africa, parts of Asia and the Middle East in the 19th century before being adopted by military officers, rapidly becoming a symbol of status – and oppression. Nothing says “goodwill tour” like parading around Africa dressed like you’re the star of some disastrously racist old Hollywood epic, wearing a symbol for empire. Why not stop off in India and talk about how much you love Gunga Din while you’re at it? Really do the grand tour. This is in keeping with Melania’s long history of seemingly not thinking through her fashion choices or at the very least not giving one single goddamn; previous instances include wearing designer heels to a hurricane and also donning a jacket that literally said “I REALLY DON’T CARE, DO U” on her way to meet detained migrant children. She damn sure doesn’t! Anyway, elephants don’t forget, either.